Wish to return an item? Surfanic are pleased to be able to offer you a no hassle, 365 day, tracked returns service. If you wish to exchange an item, simply place an order for your required replacement on our website and return the initial item for a refund in full when it is received back in our warehouse. By doing this you can be assured that the replacement item you require is in stock, available for despatch, and will be received by you in the quickest timeframe possible. 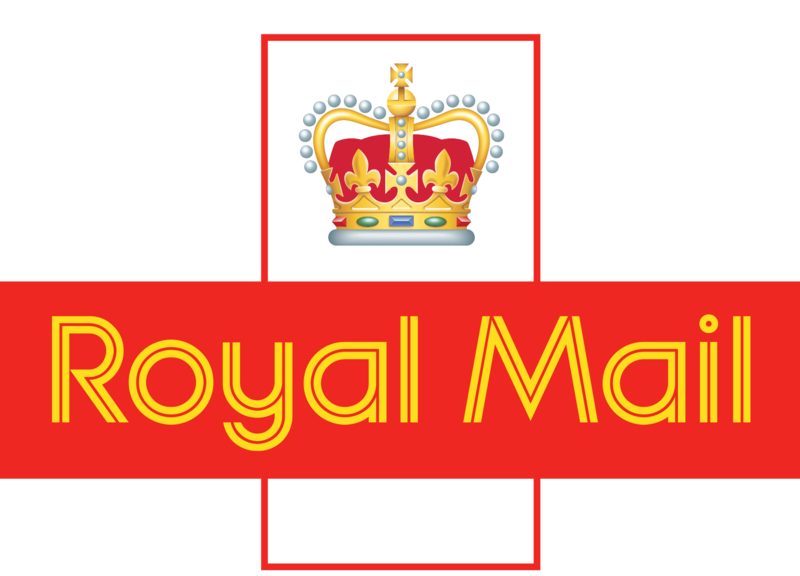 You can generate a Royal Mail pre paid label by following the steps below. Simply click the link below to be taken directly to the Tracked Returns portal. This service offers full tracking and therefore please ensure to ask for a receipt as it will contain your proof of postage along with your tracking number. Complete all the information regarding your return including order number and number of items being returned. (If you do not know your order number or you are sending back more than 1 order combined please enter your Surname instead. Is your item less than 20kg and smaller than 61cm (L) x 46cm (W) x 46cm (D)? If not you will not be able to use the Free Tracked Returns service. You do not need to return your order in the same packet it was received in. If you are returning a small number of items that were delivered in a large cardboard box we recommend packing these in a smaller bag to reduce size to below the required measurements. It is with regret that we are unable to offer a Free Tracked Returns service for a limited range of products on the site due to the product dimensions. We feel it is better to offer all customers an amazing price point when ordering from us rather than penalizing all customers by applying a surcharge to cover return postage. Products excluded from the freepost returns service will be clearly labelled. This does not affect your statutory rights. All items can be returned for a full refund within 365 days but for these large items the Free service will not be accepted and the return postage costs are payable by the customer. 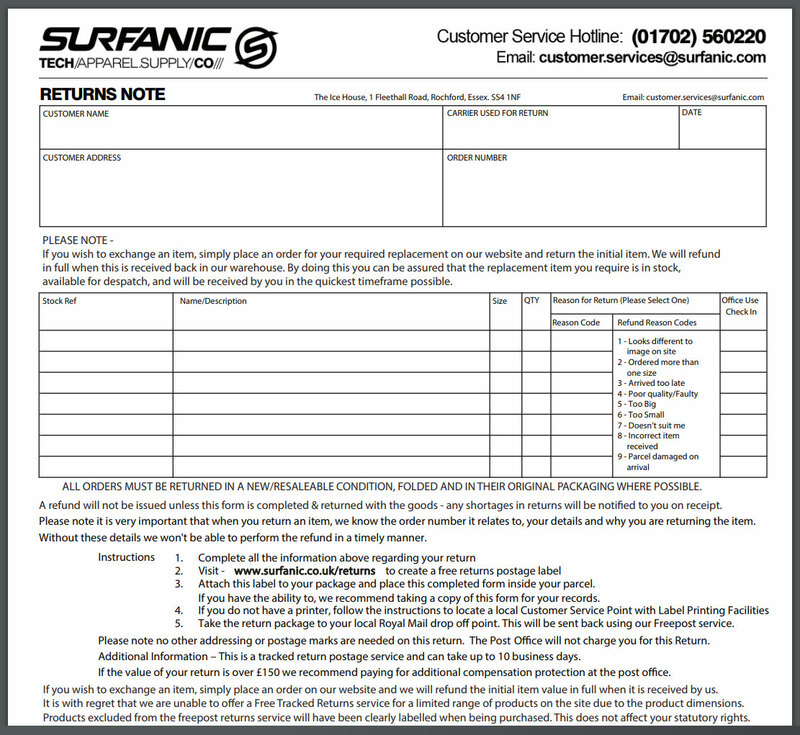 Surfanic International Ltd is confident that you will be very happy with your purchase, however if you wish to return any item we will be happy to offer you a full refund or exchange. All goods returned must be in a new and unused condition, and returned with the original proof of purchase. Returned items must be received within 365 working days of delivery to qualify for a refund. Please note goods purchased online at surfanic.co.uk cannot be returned at any other Surfanic retailer. Any product purchased from a Surfanic retailer must be returned to that original retailer for a refund or exchange in line with their individual policy. Additional Information – Additional Information – We use the Royal Mail Tracked Returns service. Please note this can take up to 10 business days. If the value of your return is over £150 we recommend paying for additional compensation protection at the post office. Surfanic International Ltd is confident that you will be very happy with your purchase, however if you wish to return any item we will be happy to offer you a full refund. Customers are responsible for all return delivery costs unless an item has been delivered to you faulty or incorrectly. If you have received an item that is faulty or sent incorrectly, please contact our customer services team via email (customer.services@surfanic.com) or phone +44 1702 560220. We recommend items should be returned via a tracked delivery service to ensure your item arrives at Surfanic. Surfanic cannot accept responsibility for items that are not returned by a recorded delivery courier. Upon inspection of returned products Surfanic will issue a full refund to the payment method used for the purchase minus the original delivery charge. Any products deemed to be used will not be refunded. Complete all the information on the returns note enclosed in your order. On the Invoice enclosed in your order, you will find a pre-printed returns label. Complete all the information regarding your return on the returns label. Attach this sticker to your package and place the completed returns note inside your parcel. If you have the ability to, we recommend taking a copy of this form for your records. Post the order back to Surfanic. We recommend items should be returned via a tracked delivery service to ensure your item arrives at Surfanic.